Fuji, one of Japan’s industrial giants, began to make Rabbit motor scooters in 1956. (Be sure to look for one in the motorcycle wing.) 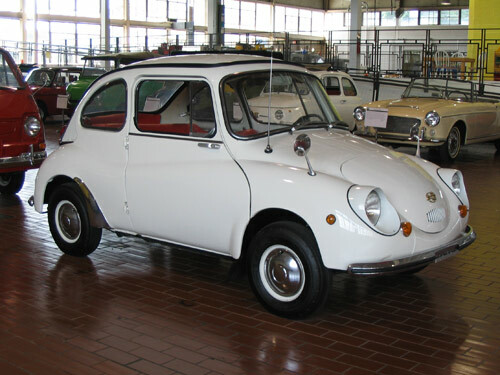 Two years later they launched their first car–the Subaru 360. While the 360 sold well in its home country, it was not so well received abroad. This car was imported into the U.S. until the 360 was named by Ralph Nader of Consumer Reports as “the most unsafe car on the market.” Fuji has been linked with Nissan, Subaru, and Toyota since 1968 and continues to build cars. Malcolm Bricklin became the official U.S. importer in 1968. The 360 was offered in four different body types: a standard sedan in white; a sports model called “Young S” in SOA (Subaru of America) Yellow and Cherry Red; a van; and, rarest of all, the pick-up truck. Manufacturer: Fuji Heavy Industries, Lt.